It is starting to come together, but we still have some work to do. The next element adds winter interest to the garden. 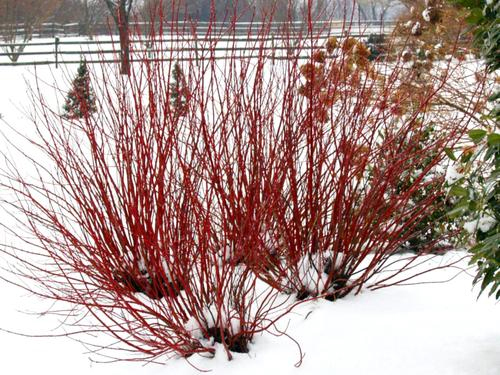 We will add another favorite plant, the Arctic Fire red twig dogwood. It’s main ornamental feature is it’s red stems in the winter. We will add one in the bed between the paving stone out in the yard and the patio area. We will add another one between the Canadian hemlock and the Japanese maple. These two will add depth to the garden views from the house as one will be in the foreground and the other will be in the background. 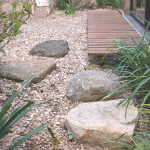 This connection will help to tie the garden areas together. 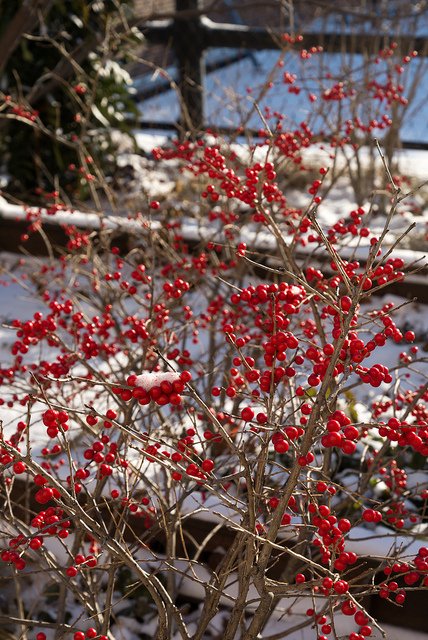 If we wanted something different, we could substitute winterberry holly (Illex verticillata). This would provide red berries in the winter. This might actually look more natural in the winter landscape. However, the berries will not last as long in the winter as the stems. So there is a trade off. Another trade off is that winterberries only fruit on female plants and you will need to plant a male plant somewhere around the yard to get the berries. ‘Red Sprite’ is compact cultivar maturing to 3’ to 5’ high with lots of large bright red berries and dark green leaves. This is the female plant I would plant in the redtwig dogwoods places. I would then find a spot somewhere in the yard nearby to plant a male pollinator like Illex verticillata ‘Jim Dandy’. The next plant will add some Summer flowers. This plant will be another of my favorites, the Pee Wee Oakleaf hydrangea (Hydrangea quercifolia ‘Pee Wee’). This compact form of this native only grows 3′ x 3′. Its leaves also are a bit smaller than the species. While it is a great shrub with exfoliating bark and red/purple fall color, it’s main attraction is the long lasting white then pink flowers. If we instead wanted to emphasis Spring flowers we could use another great native plant, the Blue False Indigo (Baptisia australis). This shrub like perennial has blue indigo colored flowers. I like this plant so much, I will profile it in my next post. I will also use it in some of the images I create for this design. 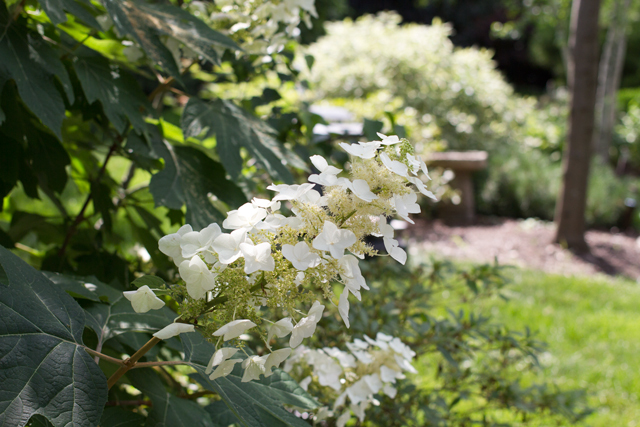 For today however, we will stick with the Oakleaf hydrangea. Here we will add them mainly around the evergreen boxwood groupings. The white later turning pink flowers of the Pee Wee Oakleaf hydrangea with add some color to the garden in summer for a good month. 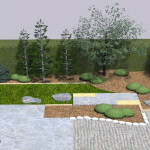 Our design is still kind of sparse, so we will fill out the ground plan with an evergreen and a perennial flowering ground cover. I won’t fill all the spaces, as I want to leave room for a few other goodies I will put in the final post. The evergreen ground cover could be something like Japanese Pachysandra, Vinca minor or something native and not so aggressive like Kinnikinnick (Arctostaphylos uva-ursi). The flowering perennial could be any low grower that looks natural, such as Corydalis, wild Geranium (Geranium maculatum), or even a low growing ornamental grass like Japanese forest grass (Hakonechloa macra) for a textural contrast instead of flowers. 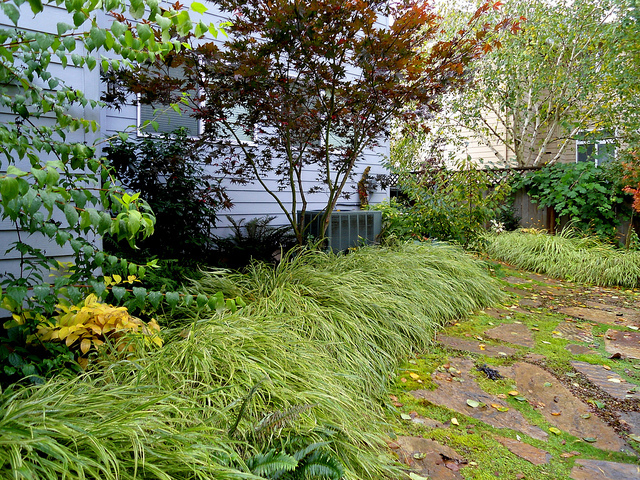 Japanese forest grass as an edging plant – Beware however Bunnies LOVE it! Here is how the design looks with these plants added to fill out the ground plane (remember you can click on it to see a larger version). In the final post of this series in two weeks, I will wrap up the design by adding more plants and other features. We will see how the design will look from different views. By doing this we can get an idea of how the design will actually look if built. 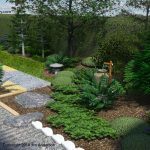 Ed, you may want to look at the final post in this series when it is published for some specific ideas that would fit the scale of your garden. 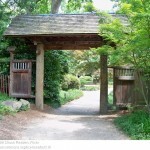 Also if you go to the sidebar and select Japanese Garden category there will be some more posts that could be helpful.